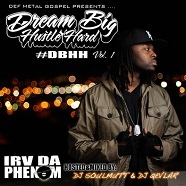 Lending a bit of his freakish flows to “Nightmare”, Krizz Kaliko drops in with Irv Da Phenom to light it up for his Dream Big Hustle Hard mixtape. The eerie and outlandish vibe of the track is set off by its unique synths and drum patterns. A deep bass line thumps just below the surface and gives the track an extra boom for your speakers. Kaliko kicks it off, twisting words like a verbal pretzel, and leaving MCs helpless to his delivery. Being different is nothing new to Kaliko, and “Nightmare” allows him to step out of the normal boundaries in hip hop. With Irv building a wall of vocals over the hook, the track hits listeners like a warped club banger. Brotha Lynch Hung also appears courtesy of Strange Music, and closes out the track with a grim verse.